Meet the BRITZ EVOLVE - DiSCOVER A NEW WAY OF TRAVEL. Save money on the road, with DC charging included and no EV road user charges. Receive a detailed campervan show through on pick up to fully get to know your vehicle and ask any questions you may have, as well as the backing of our on road team, 24/7. Really take the time to explore New Zealand; plan your itinerary by where you’ll be charging throughout the day and take the time to stretch your legs, meet the locals and explore a new destination. With the Britz eVolve new to the Britz range, our customer feedback has been really positive. 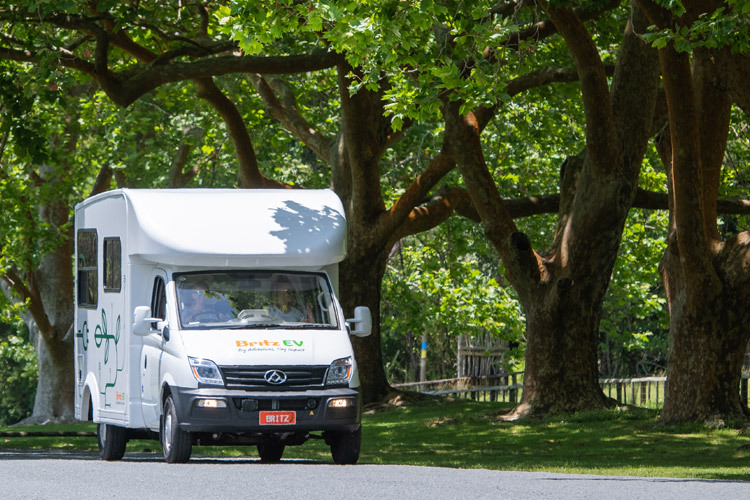 The eVolve provides a low emission driver experience that enables you to experience New Zealand in a truly comfortable and eco-friendly way. Get to know the camper, below. The smooth and super-quiet e-LDV chassis is a dream to drive and sleeps two people comfortably, with a range of up to 120km, depending on driving style. Combined with the shower, toilet and cooking facilities, this custom-built vehicle allows you to enjoy all the benefits of a campervan holiday while reducing your carbon-footprint. Now, that’s a WIN-WIN. Electric vehicle driving range - up to 120kms depending on driving style and conditions. The Britz Electric Vehicle is fitted with an in-vehicle tablet packed with features to make sure you don’t miss anything along the way. Campermate which suggests activities and experiences near you, bookable directly from the device and locates useful things like campgrounds, petrol stations, EV charge points. The eVolve features automatic transmission and has air-conditioning and heating in the driver’s cabin. The floorplans and specifications are indicative of the vehicle that will be supplied. Specifications may change without notice and cannot be requested. Solar power panels are used as backup, and assist the 12v battery power supply only. Items requiring 240v mains power will not operate from solar power, nor will these items work when not plugged into 240v mains at Holiday Park. Child and booster seats cannot be fitted in this vehicle.